The Knowledge Axis is a north-south bound route in Trondheim that includes a high concentration of knowledge-intensive institutions involved in research, education, business and public sectors. NTNU is one of the primary actor along the axis and the re-location of the social sciences campus currently found at Dragvoll, to the Gløshaugen Campus will strengthen this position. The relocation encompasses a spatial demand of 136 000 m2 of floor area and, after the completion in 2025, 17 000 additional users. In total 36 316 students and 7 550 employees will use the campus on a regular basis. The Knowledge Axis is a north-south bound route that passes through the city centre, the harbour in the north and the area surrounding the main radial highway Elgesetergate to the south. The NTNU Gløshaugen Campus is located within the Knowledge Axis, starting south to the city centre and ending up in the north Sluppen (a mainly commercial area that is planned to develop into a multi-functional neighbourhood). A residential area lies to the east of the campus and to the west a multi-functional neighbourhood that includes the St. Olav Hospital. About 10 000 people live within the campus area. NTNU hold concessions for heating and electricity on the Gløshaugen Campus. 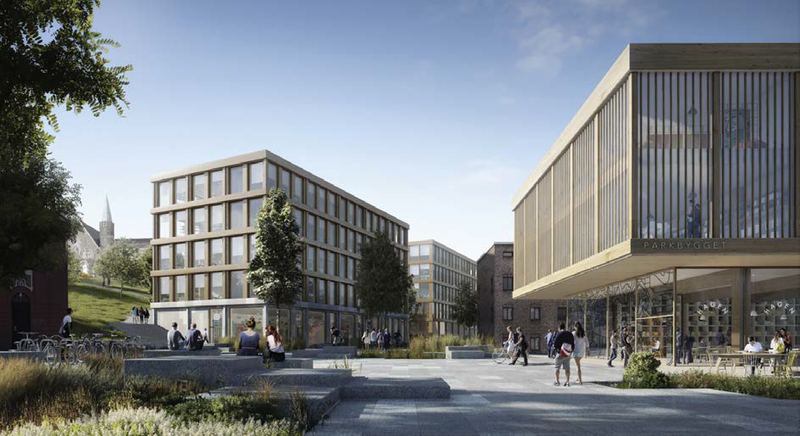 The two main stakeholders are Trondheim municipality and the project owner NTNU, which have established a project organization for the campus development that is part of the NTNU administration. Other stakeholders are the Trøndelag regional municipality and the Norwegian state, as owner of the NTNU. A smaller part of the Campus, Elgesetergate 10, is owned by Statsbygg and will in the near future be developed as a new education and service centre. The student organization SiT is an important actor with regard to student involvement and on campus service supply for students. The main goal of the campus consolidation project is to develop a campus, which provides the best environment for excellent research, education, dissemination and innovation. The vision rapport for NTNU (2014:88) describes the option to expand the vision of zero energy building «to a campus perspective, which means that all activity on and adjacent to the campus will be at a zero energy level in 2060». Application of six quality principles to ensure that the new campus has the required quality characteristics. The principles are unifying, wit, urban, network of hubs, effective, sustainable and living laboratory. These principles shall be applied to all phases of the project development.